Yes, I recently spent six weeks next to the world’s longest beach and yes, the beach was stunning. This is Cox’s Bazar, Bangladesh’s tourist resort that boasts a sandy beach of “unbroken length of 155km”. 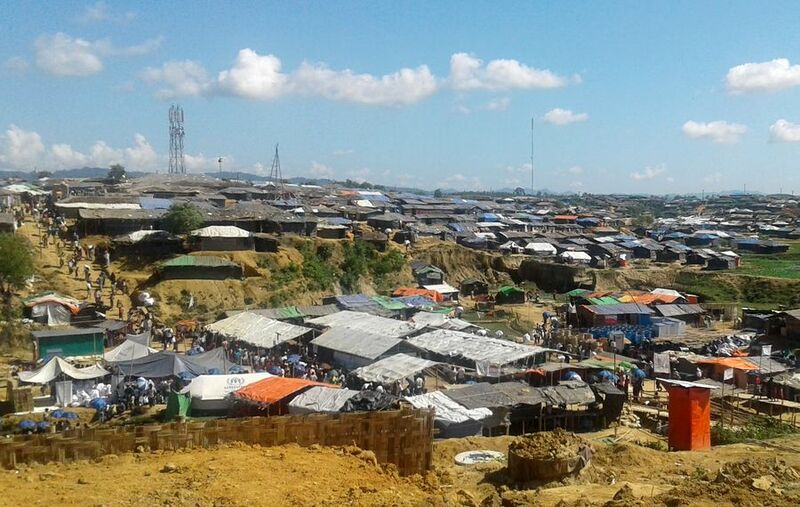 More recently the area hit the headlines following the influx of over 655,000 people who are living in camps and settlements in the area after fleeing neighbouring Myanmar. My practical experience of this crisis was a short mission, ending just before Christmas 2017. As the communications delegate of the ICRC, I was part of the team working in Cox’s Bazar in an operation serving the displaced community. I went at a time when things were somewhat “settled”, in that daily arrivals were slowing down, people already had access to some medical and food assistance and the area was teeming with aid agencies, both local and international. Numerous sector meetings were organised and programmes being put in place for a more sustainable response. There were numerous aid workers and organisations on the ground. At one point the count was 89 international organisations, including 27 partner Red Cross Red Crescent National Societies, each with their own experts and coordinators. I was part of the ICRC team comprising specialists from protection, water and habitat, health, economic security, and cooperation held together by administration, logistics, welcome and chancellery, and drivers who navigated the sometimes difficult terrain expertly. The team was small, but grew as recruitment intensified to establish a more permanent presence. The spirit, enthusiasm and dynamic dedication of the team as a collective was something not only impressive, but also exciting to be a part of. Like in any other ICRC operation, the team rallied around each other, did what was necessary, filling in for each other when the need arose. I sat in on a WASH (Water Sanitation Hygiene) Cluster meeting for my colleagues in the Water and Habitat unit, having little clue of what they were talking about. That my notes later proved useful to our engineers was quite an achievement for someone who didn’t know what a tube well was to begin with. I remain in awe of what the team managed to achieve on a daily basis, adding our contribution to the massive emergency response mechanism. 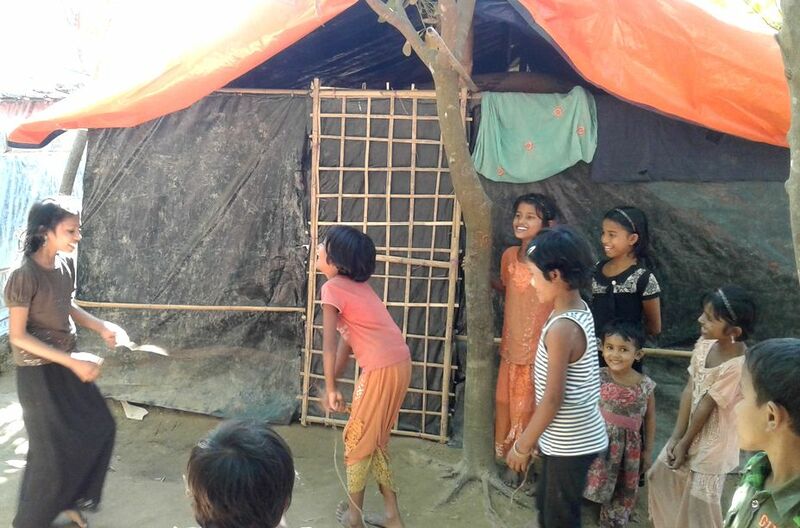 Since 25 August 2017, over 655,000 people have fled across the border from Myanmar into Bangladesh. Their plight, their stories and the images have been well documented in the media. Media interest was high, especially with talks of relocation and repatriation in the air. Journalists were often seen at camps and settlements, documenting experiences, talking to the community, in search of unique photographs to go with their stories. The ICRC had its share of media interest – with queries from journalists pouring in from all over the world — Rome, Spain, Brazil, the US and the UK, the Philippines and Switzerland. 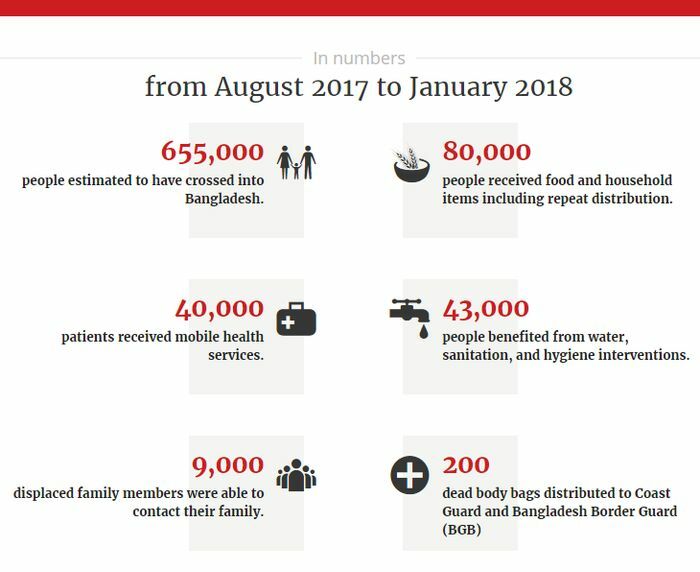 Working alongside dedicated volunteers from the Bangladesh Red Crescent Society, our medics managed to see and systematically treat 30,000 people in three months (it’s now close to 40,000), our Economic Security teams provided food and non-food items to nearly 80,000 people with over half of them receiving repeat monthly rations. There were thousands of water, sanitation and hygiene interventions and over 8,500 displaced were able to make contact with their families. In my time there, I seized as many opportunities as I could to make myself available for the field trips. Not only to collect content that we could use, but also to be a part of the work we did on ground. Very soon I also found out that carrying five hygiene kits at once was no mean feat even though our Economic Security colleagues made it seem like a smooth sail. I saw for myself how we worked; the daily and necessary dialogue, negotiation; how the teams built trust, maintained confidence of the authorities, the local community and how we worked to raise awareness of who we are and what we stood for. All this with people living in uncertain, difficult conditions and with the authorities and communities that welcomed the displaced getting weary themselves. The question I get asked the most is not “what was it like there in the camps?” but “what was the one thing that struck you in the camps?” The generosity and spirit of the displaced is what stood out for me. My favourite story is about the umbrella in Unchiprang. It’s a tale of kindness and humanity amidst so much uncertainty. Mid November last year, I was part of the team accompanying our Regional Director to Unchiprang where he met with some community leaders. 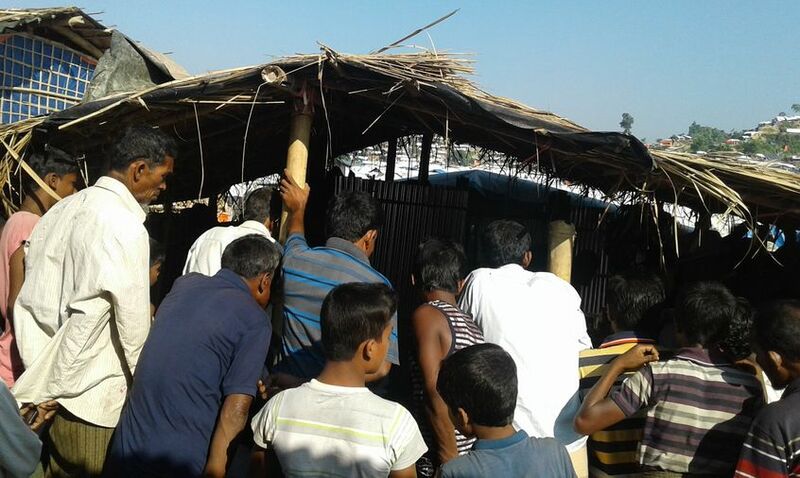 Within no time, a crowd had gathered around and as I was taking photos, I was left outside this small hut where they were meeting. A family sitting across the hut was intrigued (possibly amused as well) with this stranger who looked like them but had a white bib on with the Red Cross. As I listened in on the conversation standing on the periphery of the crowd, I suddenly felt as if the sun had disappeared and there was shade. I looked down to see the little boy from that family holding an umbrella next to me to shield me from the hot sun. That is the spirit that has stayed with me.